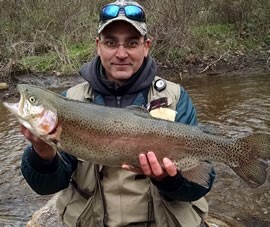 (18/P023) TRENTON – More than 184,000 freshly stocked rainbow trout will be available as anglers cast their lines on the much-anticipated opening of trout season at 8 a.m. on Saturday, April 7, Acting Commissioner Catherine R. McCabe announced today. An annual rite of spring, the opening day of trout season reels in more than 100,000 anglers each year, many of them as families. 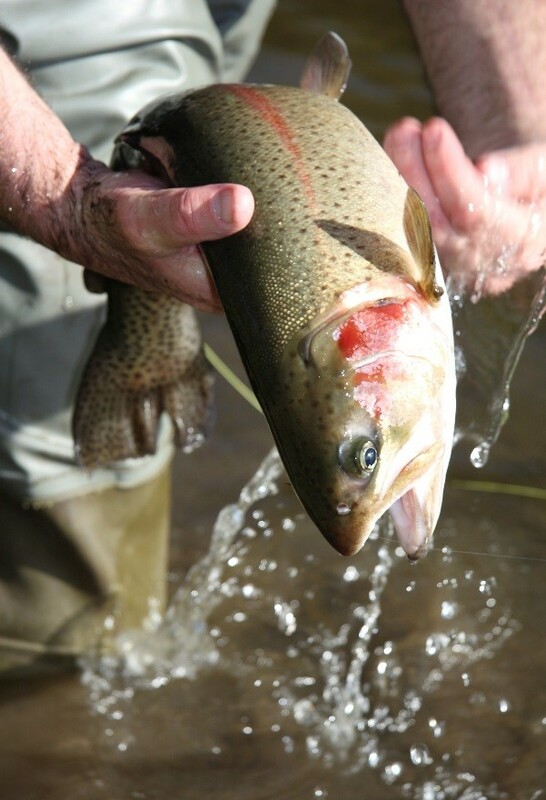 The DEP’s Division of Fish and Wildlife has been stocking waterways with rainbow trout raised at the Pequest State Trout Hatchery in Warren County and will continue to stock waterways in the upcoming weeks. More than 570,000 trout will be released in 173 streams, rivers, lakes and ponds throughout the state by the end of May. The state’s 14 major trout streams are stocked every week following opening day. These streams are closed to fishing from 5 a.m. to 5 p.m. the day of stocking to allow the trout a chance to disperse. All other trout-stocked waters are open to fishing on stocking days. These waters are generally stocked three times during the season. Select lakes will also receive additional huge trout as part of the Bonus Broodstock Lakes program. This year, 10 trout-stocked ponds and small lakes located throughout the state will each receive 30 to 50 broodstock fish, providing anglers the opportunity to experience the catch of a lifetime. These fish measure from 15 inches to 21 inches and weigh up to 5 pounds. Avid trout anglers will also be pleased to hear that plenty of the 21,000 super-sized trout stocked last fall have not been caught and will be available this spring, providing even more exciting fishing opportunities. These fish have grown even more since they were stocked. Anglers can download the complete in-season stocking schedule to their smartphones just by scanning the QR Code found in the Division of Fish and Wildlife’s Freshwater Digest or on trout regulation signs posted along all trout stocked waters. Stocking information is also available through the Trout Stocking Hotline by calling (609) 633-6765. Anyone age 16 or older must obtain a fishing license and trout stamp to fish for trout. Anglers can buy and print a fishing license and trout stamp online at www.nj.wildlifelicense.com or through license agents. A list is available at www.njfishandwildlife.com/agentlst.htm. Children under 16 and New Jersey residents 70 and older may fish for free. Introduce a friend or family member to fishing by getting a Fishing Buddy License. This license offers both an existing angler and new angler (or even two new anglers) an opportunity to receive reduced-price fishing licenses. For information about the Fishing Buddy License, visit: www.njfishandwildlife.com/fishbuddy.htm. The Pequest State Trout Hatchery is supported with proceeds from the sale of trout stamps and federal funding from the U.S. Fish and Wildlife Service’s Sport Fish Restoration Program. The dedicated funding received from the purchase of a fishing license and fishing equipment enables the Division of Fish and Wildlife to enhance fishing opportunities in New Jersey and protect the quality of the state’s waters for fish, wildlife and people.